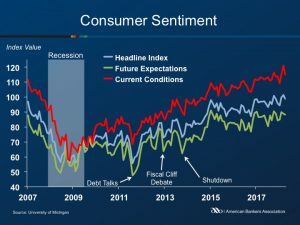 Consumer Sentiment fell 2.6 points in March to 98.8, according to the University of Michigan Consumer Sentiment Index. Last month’s index was the highest reading since 2004. April’s figure is 1.9% above the April 2017 index. The Current Economic Conditions Index slowed 6.3 points to 114.9. The reading was 2.0% above the March 2017 estimate. The Consumer Expectations Index fell 0.4 point to 84.4, however it was 1.6% higher than a year ago.